A place with contrasting temperature, Wadi Rum has been a muse to many. Famous Hollywood movies like Martian, Lawrence of Arabia, and Transformers have been shot here. It is also known as Valley of Moon for its strange, out-worldly and alien appearance and was declared a protected area in 1998. 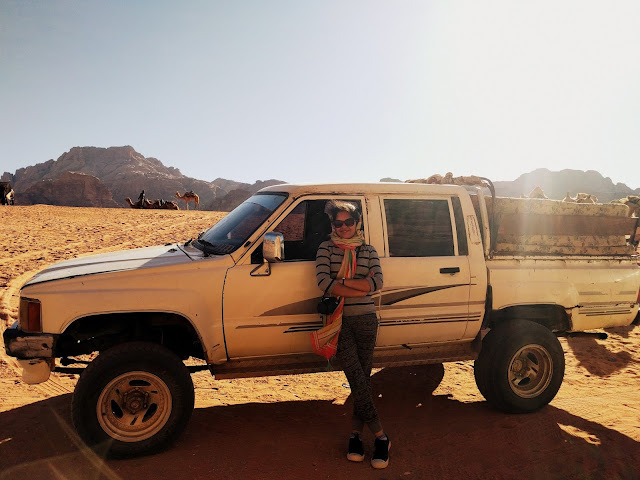 When I reached Wadi Rum, the feeling was nothing less than arriving on the sets of Arabian Nights; the land of magic, eccentricity, love, betrayal, promise & mystery. The sand dunes by the hot day, beautiful sunset and finally the night of thousand stars make Wadi Rum a picturesque destination. As soon as our troop arrived, making our way through the Visitor Centre we hopped on our Jeeps for Dune Bashing but not before witnessing the great “Seven Pillars of Wisdom”, an autobiographical work of T E Lawrence. He did not mention about this mountain but took the title from the Book of Proverbs (9:1): “Wisdom has built a house; she has hewn out her seven pillars”. In fact the local bedouin referred to this mountain as Jabal al-Mazmar ages back, but now it’s famously known as “Seven Pillars”. With stories like these about Wadi Rum, we started off-roading on the sand dunes. I was so ecstatic to check off dune bashing from my wish list in Earth’s own little mars. We took a break near a heap of sand, I walked up and up, and everything looked so minuscule. I kept gazing at the grandness of the place, and found red sand and tall mountains all around. It was overwhelming and I couldn’t help but think that how small we are and yet never get tired of showing off our pride, a lie. Please note that you have to climb barefoot and mind you, that’s gonna be a pretty hot affair. 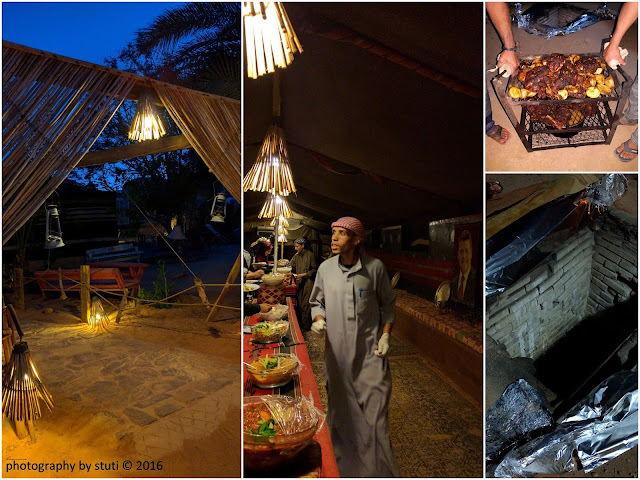 Before checking-in our camp by the sand, we stopped by a small bedouin camp kind of a restaurant for a cup of Jordanian tea. Nothing seems better than a cup of tea shared with new friends made on a journey so amazing. It was hot, it was red; truly reflecting the colours of Wadi Rum. On entering the restaurant what caught my eye was the carving of Lawrence on a rock and the site is very near to the Lawrence’s spring. We soon left for camel safari towards the sunset site (Al Ghuroub). It was a little tough terrain but felt like a soothing balm to my adventurous soul. The site was literally proving to be an oasis in the middle of the desert. It was my first camel safari as well. The depth that place offered was unfathomable. The journey from the sunset to twilight and the colours thus offered by the Mother Nature gave me goose-bumps. It was a bumpy ride back to camp on Laila’s back but an exciting eve in the camp washed away all my tiredness. Camping at Captain’s Desert Camp. Aye Aye! 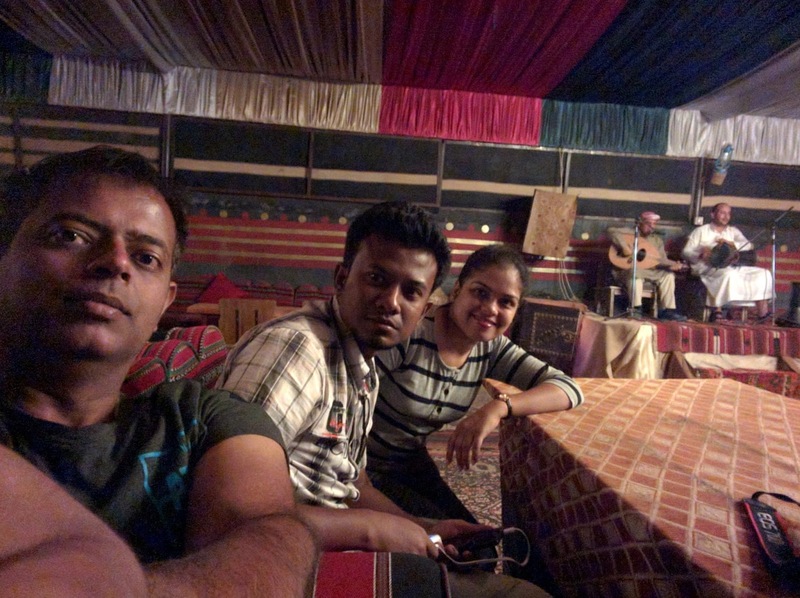 A musical night at the Bedouin camp welcomed us. We sat in the big hall and listened to Mohammed Ali playing Oud accompanied by his partner. I thoroughly enjoyed the evening with my friends. Not far was the dinner prepared in a special way, ‘Zarab’ – the underground cooking in which the pit is covered with sand. The meat and veggies were cooked and were part of the main course along with a series of salad, bread, vegetable, non veg, pickles, different kind of yogurt and sweets in the end. As night took its toll, we hit the sack in our luxury tents. It was a beautiful night but soon turned eerie with the noise of screeching dessert foxes cutting through the silence of the desert. The morning was equally overwhelming and chilly when we started for our next stop. Stay tuned to know about the rest of the journey. Laila? At Jaisalmer you can find a lot of Salmans and Shahrukhs. Great to read this post. I want to go to Jordan too! 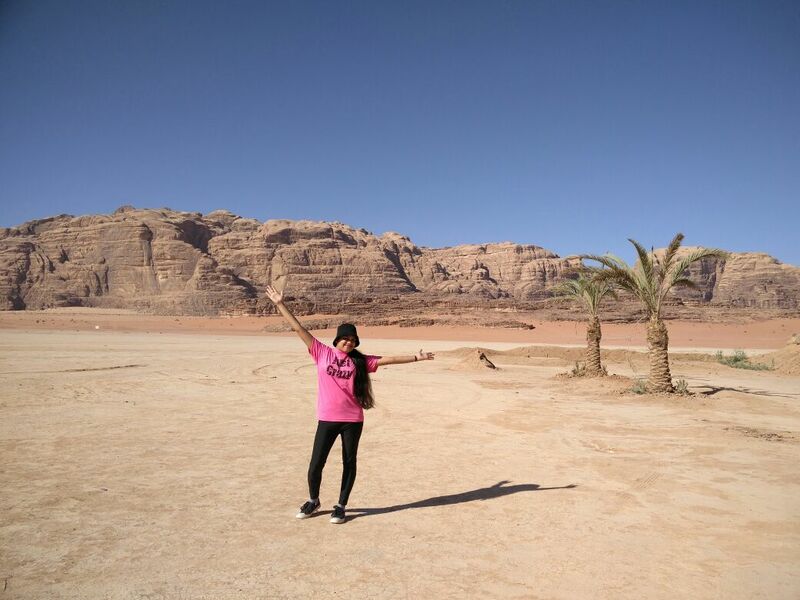 So good to see a post on Wadi Rum from you. It was definitely my most favorite place in Jordan. I loved the moments at the sunset point.